One of 2012’s most anticipated blockbuster releases is Ridley Scott’s Prometheus. Written by John Spaihts (The Darkest Hour, oh dear) and Damon Lindelof (Lost), this gripping science fiction thriller features an all-star cast, including Noomi Rapace, Michael Fassbender, Charlize Theron, Idris Elba and Logan Marshall-Green, and is an awe-inspiring spectacle. It is the year 2089 and an archaeologist couple, Dr. Elizabeth Shaw (Rapace) and Dr. Charlie Holloway (Marshall-Green), discover an identical star map in the artwork of several ancient Earth civilisations. It is potential evidence that humanity’s forerunners – the believed creators of mankind on Earth known as "Engineers" – may still exist on a distant planet. Peter Weyland (Guy Pierce), excited about the prospect, enlists a team to accompany the archaeologists on the space vessel Prometheus, which arrives in 2093 after a lengthy stasis. After exploring an enormous alien temple, the crew discovers monolithic structures and evidence that the "Engineers" existed. But what they didn't expect was that their presence awakens an inexplicable threat that needs to be contained. I guess I will get the issues out of the way first, because as much I liked this film, there are issues that need to be considered and addressed. I feel like there was just too much introduced. There are a plethora of themes delved into – whether God exists and was truly our maker, infertility and ones inability to bear a child, amongst others – but it is unfortunate they aren’t explored in more depth. The film’s final act, after a well-paced build-up, does feel somewhat episodic and rushed despite never failing to be engaging. While the script – which is the film’s primary weakness - has ambitious intentions of combining scientific discovery, terrifying creature horror and these aforementioned universal themes in a sophisticated and intelligent manner, it doesn’t feel like it does all the time. It is these moments that let the film down. For example, two of the characters - a ‘biologist’ and a ‘geologist’, played respectively by Rafe Spall and Sean Harris - don’t actually seem to possess a brain at all, and their wacky partnership and comic relief just doesn’t work, especially when the rest of the film is so dark and intense. More issues emerge depending on your expectations about the film. Initially, when the campaign started (and one can debate whether there has been too much), it was widely accepted that Prometheus was to be set in the same universe and serve as a prequel to Scott’s 1979 masterpiece, Alien. Through the early stages of production, this was the idea, but when Lindelof was brought in to re-write Spaihts’ script, some new ideas and an alternative mythology were introduced. Throughout the film there are hints that the former is the case. I recognised one particular hole in this theory, which proved to be frustrating. Taking into account that the film is an individual entity, one would wonder why there are so many evident attempts to tie it in. I am unable to justify why a lot of it worked for me personally without going into details, so I will leave it at that. There are strong performances across the board, but with the exception of Dr. Shaw and David especially, some of the characters were also disappointingly conventional. Idris Elba’s Janek, the Captain of the Prometheus, gave his role some unexpected joviality. He does not care about anyone but himself, or if Shaw and Holloway even find anything. Charlize Theron’s Meredith Vickers, a representative of the Weyland Corporation, has a tight upper-lip and needs to feel like she is in control. She is a suspicious character throughout, and Theron does a good job. As I mentioned, Spall and Harris’ characters were silly, though ultimately proved essential to the plot. It feels like I have been saying this a lot lately, but Michael Fassbender is once again fantastic. David is certainly the film’s most complex character. He serves as primary source of intelligence for the mission as well as being the overseer of the crew's welfare. 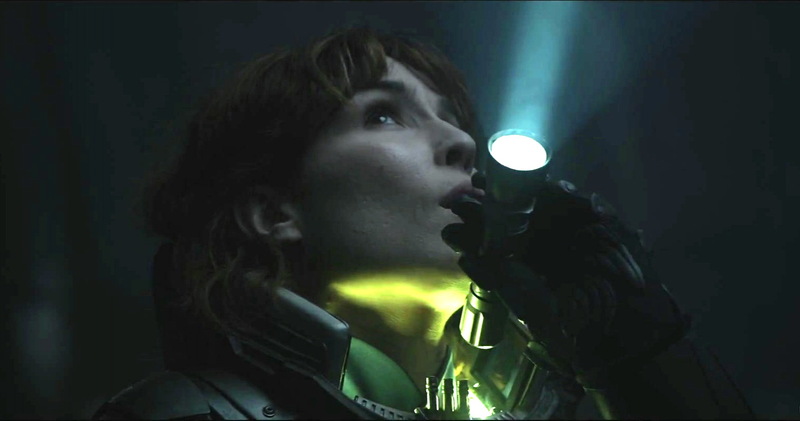 Noomi Rapace was really impressive, also. While there wasn’t much emotional connection established with the other characters, this was not the case with Rapace. What she goes through is traumatizing – and her joy at the discovery made during the initial exploration is quickly reversed by the unexpected secrets it holds. But what I loved about this film was the spectacle built by Scott and his effects team, and how genuinely thrilling it was. I don't remember not having my mouth open in awe by the stunning visuals and epic set pieces. The tension and suspense is maxed out to the extreme and the jump scares, used sparingly, are effective. It draws out the full range of emotions. Prometheus, like the Nostromo in Alien, is a character in itself; tranquil when David is patrolling the hallways alone, a haven following the ordeals of the team in the temple, and eventually an unsafe, threatening environment. The film is full of moments of pure brilliance, and despite the aforementioned faults, these are strong enough, and frequent enough, to give it a strong recommendation. So, on a visceral level – as a cinematic experience – Prometheus is unmissable, and I think for the most part it is an excellent film. The lavish visuals are awe-inspiring, the effects excellent, Scott constructs a unsettling atmosphere, and it is consistently extremely tense. The only recent film I can think of that has come close to Prometheus on an intensity level is The Grey. As an effective sci-fi/horror hybrid, Ridley Scott is back after a decade of less-than-memorable projects. There will be plenty of discussion aroused and it will definitely prove to be divisive. With such ambitious themes - which might be further enriched by another viewing – it is very advisable to go into the film knowing as little as possible. I have tried to keep details generalised and I hope I have justified my somewhat puzzled, albeit positive, reaction to this entertaining and heart-pounding thrill ride. Totally fair enough Simon. It is best to know as little as possible going in. It is a positive review, and I hope you enjoy it as much as I did. Great review! So glad that you liked it and despite the weak script the film still manages to be good. There are faults - a lot of which are easily forgiveable - but the film's ambition, spectacular atmosphere and stifling suspense should win anyone over. It is a pity, and I have been wrestling with these thoughts, that there are some decisions that just don't make sense. This will frustrate many. I hope you love it, I really do. But if you don't, I will understand why. Good review, Andy! There were impossible expectations so I wasn't expecting a masterpiece. Particularly in terms of suspense I think it worked. I gave Prometheus 7.6 in my monthly reviews. I disagree about the script being weak, I like it when a blockbuster dares to have food for thought, which I think will mean the film will appeal to all ages, and maybe it will inspire other blockbusters to follow the same path. There are not enough matrix's, and such, out there! At least Prometheus tried something different with the writing than the other Alien entries which I applaud. Thanks Chris. Yeah, I had pretty steep expectations, and I really felt Ridley Scott was going to come up with something pretty special. I think he has. I think it will grow on people and be a film remembered beyond this season and this year. I think it has legs - and will be contested and debated for a long time to come. I felt like the only weakness was the script, in that it tried to cover too much. It should have been 10 mins shorter (and left out one key introduction at the end, I think you know the one), or 20 minutes longer and went a bit deeper and not left plot holes. The build-up was so good, then crazy things start to happen and there is no time for us, or the characters, to reflect/react to what is going on. Lindelof didn't really develop any of the characters, with the exception of Shaw and David, and I think some of the dialogue was pretty poor. But as for world-building, atmosphere, visual spectacle, sound and suspense it can't be faulted. Lots of scenes are branded in my mind. Worthy of another look. I really couldn't shake off my feelings of disappointment with this Andy. The script was woefully bad and had plot holes aplenty. The visuals were indeed stunning but behind it all lay a heavy feeling of hollowness. Great review though. Even though I was not as disappointed, and though I enjoyed it I was too, I understand your reaction. I too felt like it was let down by the script, but I was so immersed in the world, and I felt so emotionally attached to Rapace's character - so she won me over - that I still enjoyed it immensely. Thanks for reading! A lot of the reviews i've read seem disappointed. Glad to see a few positive ones, though the scripts seems to be a common complaint. I get the same impression from a lot of other reviews. I was even a little disappointed - in the script/story, but not in the visuals and the suffocating tension Scott builds. I think it has the potential to become a classic. It has several unforgettable moments.